Who will Mitt Romney choose as a running mate? Fake news suggests that he'll pick a mild-mannered version of himself. 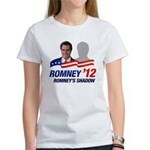 This funny anti-Romney design features Mittens and his running mate - his own shadow. 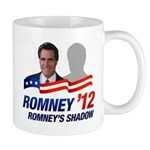 Romney - Romney's Shadow 2012! To order by phone, call toll-free at 1-877-809-1659 from Monday - Saturday 9:00am - 9:00pm EST. You'll need to note the Product Number 030-649095059 to make your order.